So you’re coming from an environment where your deliverables are HD (1080p) and you want to get into editing in 4K. Be prepared for a shock when it comes to your infrastructure needs. Assuming you currently have a 1000BaseT network and some sort of network storage, your Network currently can handle ~ 109Mb/sec. Broadcasters have standardized on OP1a MXF delivery, which is 50Mb/sec. Your current 1000BaseT infrastructure can handle that. If you’re looking at switching to a 4K workflow with HD deliverables, you’ll likely be working with a Full 4K ONLINE RAW workflow or transcoding to HD proxies. As you can see above, a single HD ProRes proxy is 220Mb/sec, or nearly double the bandwidth of your existing 1000BaseT network. A 4K ONLINE RAW workflow using REDcode 5:1 is 81.32 Mb/sec per 4K stream. So, you’re used to OP1a MXF HD deliverables at 50Mb/sec. Now, for 4K editing every stream is ~80 to 220 Mb/sec. Wait, there’s more! If you decide you want to deliver in 4K, Netflix is currently the leader in 4K distribution. To get your content on Netflix in Canada you’ll be delivering Prores 4444 files to Juice Inc., (the Canadian aggregator for Netflix) for them to create the necessary IMF Application 2 Extended deliverables. 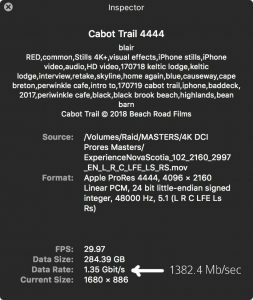 According to Apple, Prores 4444 has a datarate of 1414 Mb/sec (see above table). In the real world, I have found it to be 1382 Mb/sec. OK, pretty close. The best performance you could hope for with a 10GbE network is only 8729 Mbps or roughly 1,091 Mb/sec. Welcome to the new world of 4K. Anyone planning to work with 4K implement a 20GbE infrastructure as a minimum.